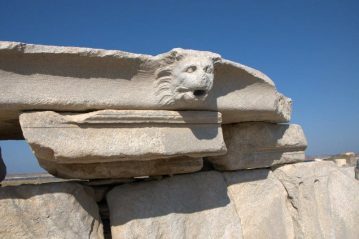 The island of Delos sits in the sparkling Aegean Sea in the centre of a circle of Greek islands called the Cyclades. Just a 25-minute boat trip away from Mykonos it’s one of the most important mythological, historical and archaeological sites in Greece. It’s also the mythical birthplace of Apollo, god of light, truth and music and his twin sister Artemis. 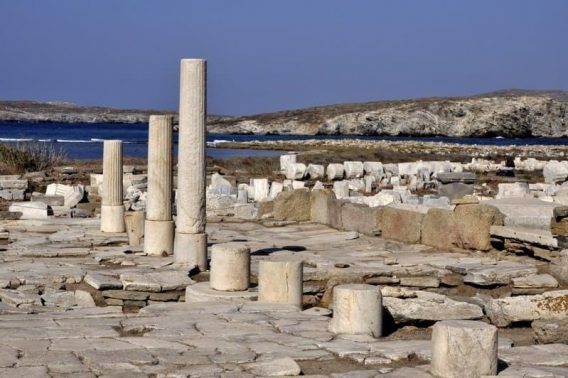 For over a thousand years Delos, Isle of Light, font of life, was a sacred place and is today UNESCO protected and part of the World’s Cultural Heritage. And it’s beautiful. A morning excursion from our cruise was spent exploring the sprawling ruins of the ancient shrine. The island is 3.5km south-west of Mykonos and just 5k long and 1.3 wide so this can be done in less than a day. Just as well really because the island shuts at 3 pm when the last boat leaves. This tiny island was inhabited from 3000 BC by a population of around 25,000 and by 300 AD was completely abandoned. 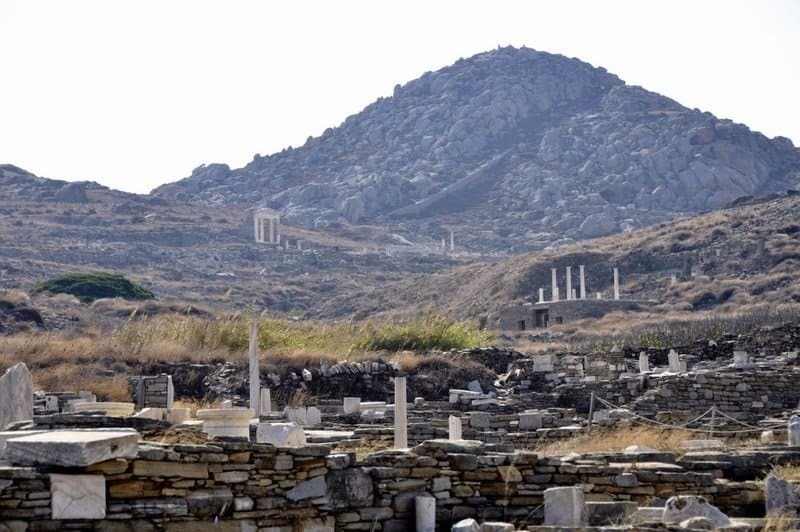 At one time, Delos was so sacred that people close to death or giving birth were kicked out to a neighbouring island. It would seem things have gone full circle as the only inhabitants are now the team of archaeologists working on the ruins. This makes it a peaceful contrast to busy Mykonos just across the water. The theatre once held up to 5,500 spectators. 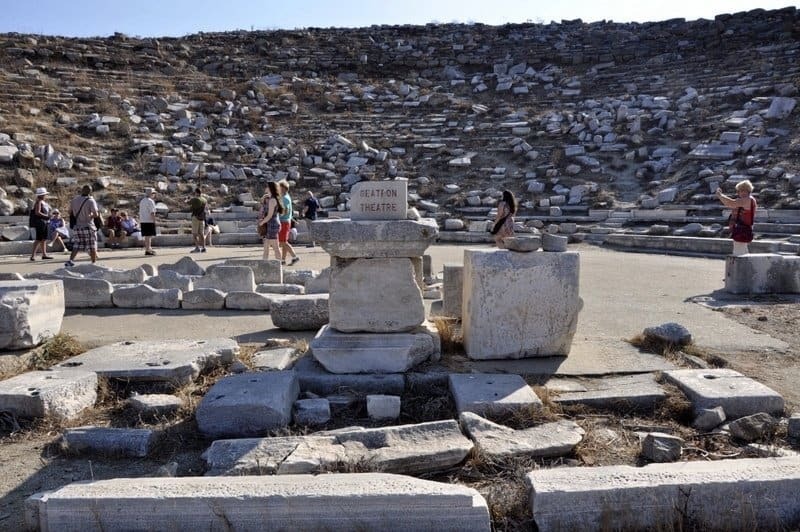 Nearby is an underground water cistern – there was no fresh-water on Delos so drinking water was captured from the rainfall and stored in the cistern. The remains of many mansions are near to the theatre. Obviously ‘the place’ to live. The mansions must have been impressive with outdoor pillared courtyards, two or three levels have intricate mosaic floors. 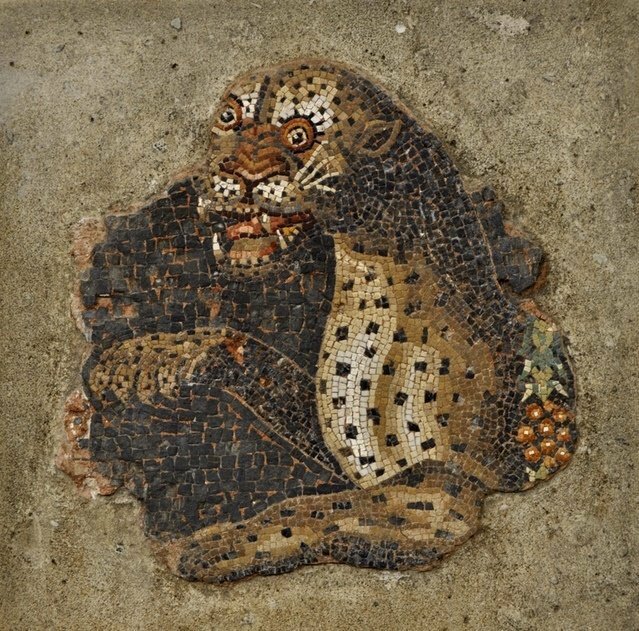 The House of Dionysus (below) has a mosaic showing Dionysus riding a panther. The Sanctuary of Apollo lies at the heart of the ancient remains at the end of The Sacred Way. The remains of a massive statue of Apollo rests here although only the torso is left – probably because it was too heavy to loot. One of the hands rests in the Delos museum and a foot resides in the British Museum. 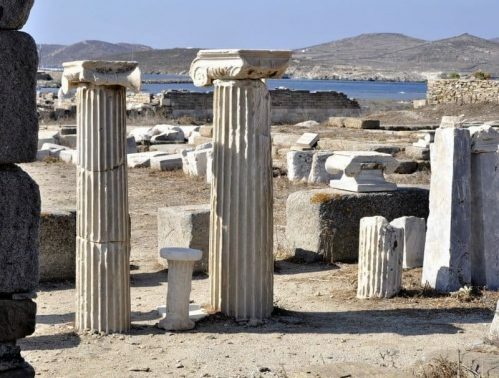 This is probably the most famous of Delos’ sights. The lions on the Terrace of the Lions are replicas of a possible nine to twelves lions that once guarded the wealthy trading port. The remaining five original lions are now housed in the island’s museum. 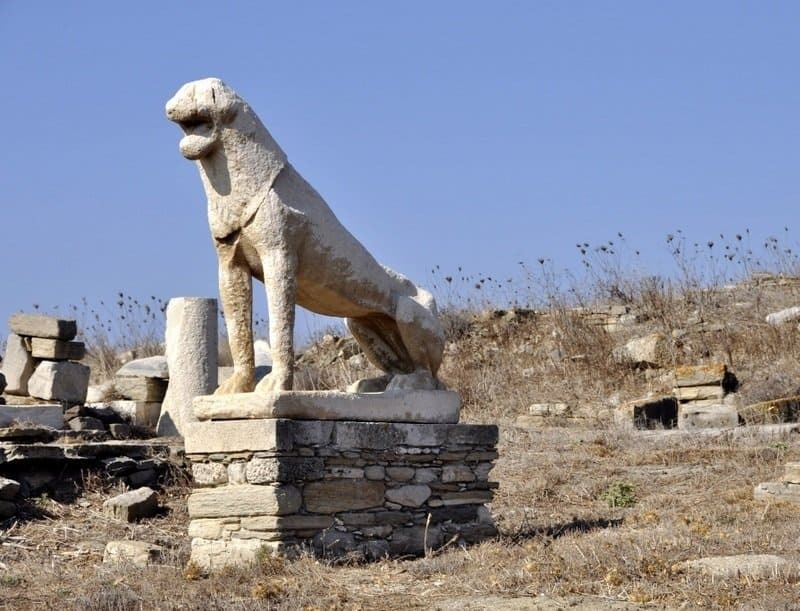 The lions were a gift from the people of Naxos in the 7th century BC – an imposing sight to guard the ‘sacred way’. 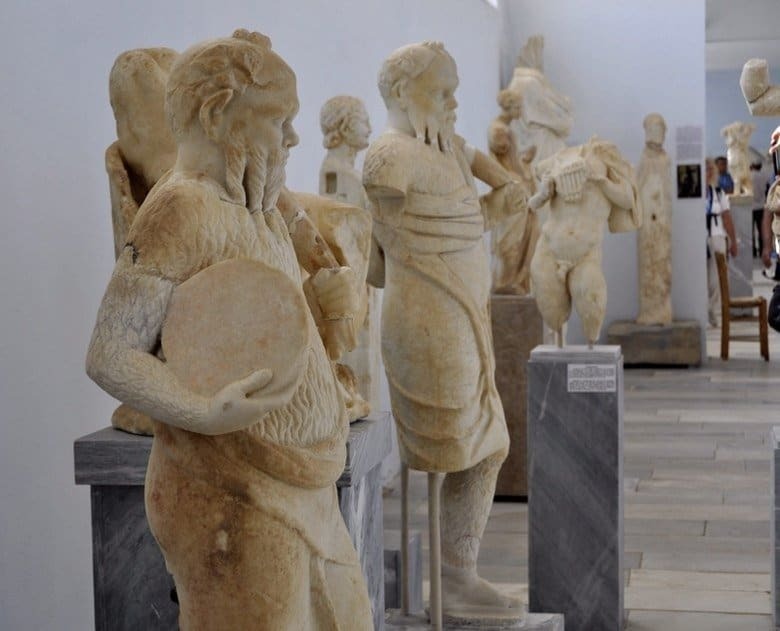 Most of the significant finds from Delos are now housed safely in the National Archaeological Museum in Athens but there are still some interesting and beautiful pieces in the museum at Delos so it’s worth taking a look inside at the statues, pottery and mosaics. 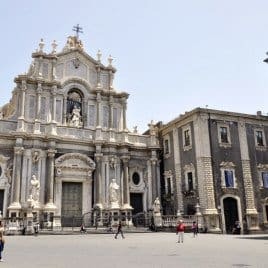 I enjoyed just wandering the island for a couple of hours soaking up the feeling of a place lost in time and bathed in light, seeking out carvings in the stone as tiny lizards scorted through the dust around my feet. I’d have liked to climb Mount Kynthos for views down over the island and stopped off at the Temple of Isis on the way up but didn’t have quite enough time. 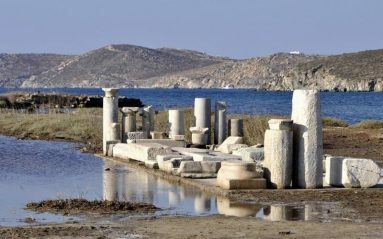 Here’s a few more images of what I discovered on Delos. Boats leave for Delos from the Old Port of Mykonos daily, weather permitting, except Monday when the site is closed to visitors. There are toilet facilities in the museum. 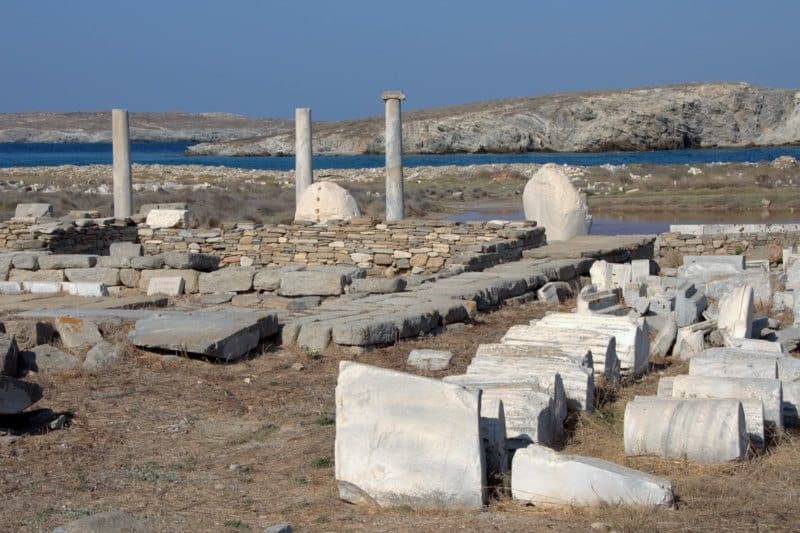 It is not possible to stay overnight in Delos. It’s very hot with little shelter so I’d advise taking water, a hat and sunscreen. Many thanks to Celebrity Cruises for hosting me on this fabulous cruise. 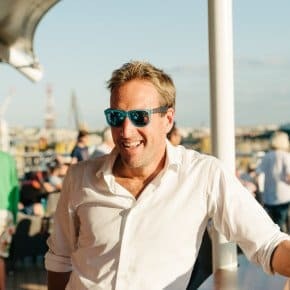 I’d never even heard of Delos till reading this! 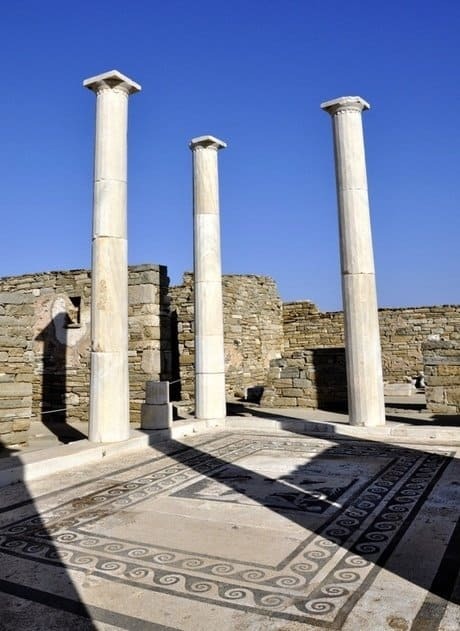 It all looks so beautiful – I especially love those pillars and mosaics at the house of Dionysus. 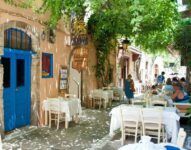 I haven’t been to Greece for nearing 10 years but seeing all your recent pictures really makes me want to go back!! 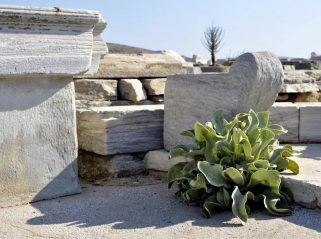 I’d never heard of Delos either and it is beautiful and such an important cultural and architectural site in Greece. The mosaics were especially beautiful. Were you able to stay on Delos? If not any suggestions about where to stay, such as Athens as a home port? My memories of Delos are pretty hazy, Suze. Heat and the lions are about it! But it was so many years ago, you wouldn’t believe! (I know- you would!) You’ve done it full justice here. Thank you Jo. I enjoyed my time there and the colour of that sea was unbelievably blue! 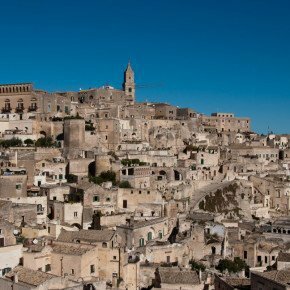 I’ve been to Crete & Santorini but that’s the extent of my Greek travels – I’d love to get back there and see more of the islands. A photographer’s dream – I definitely need to re-introduce myself to the Greek Islands as Mykonos was just too brief a stop. 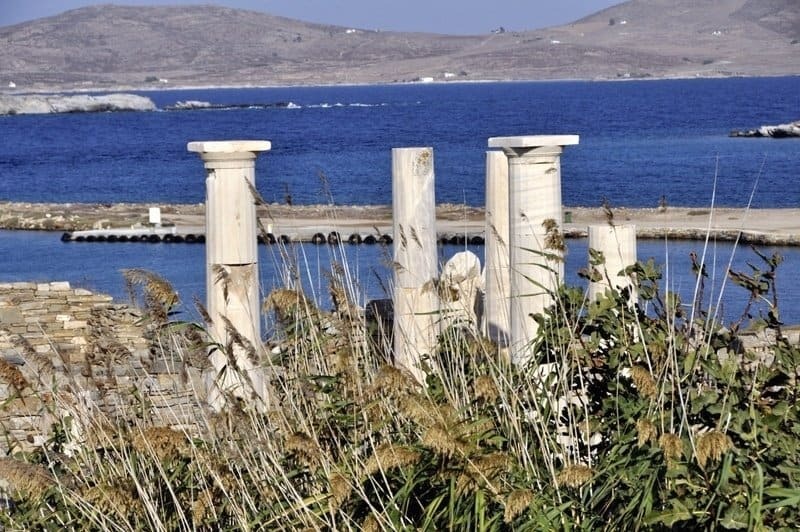 I spent months, a long time ago, living on Paros but did not hear about Delos. Gives me an absolute reason to return. To say the island looks stunning is an understatement and that apart from the history. Gorgeous photos. This looks like a magical place. I would love to be able to wander the ruins freely and look at the wonderful archeological ruins (especially the mosaics!). Is there anyplace to get food or drink on the island, or is it best to bring a picnic lunch? My one trip to Santorini was magical – I can only imagine what Delos would be like! Definitely on the list now 🙂 Thanks for sharing this amazing place. I love your photos there! I’ve never actually been to Greece but it looks like an excellent place to own a camera! Delos and Mykonos were both very photogenic! What a beautiful island! The first time I learned about the Cyclades was when I watched the opening ceremony of the 2004 Summer Olympics. 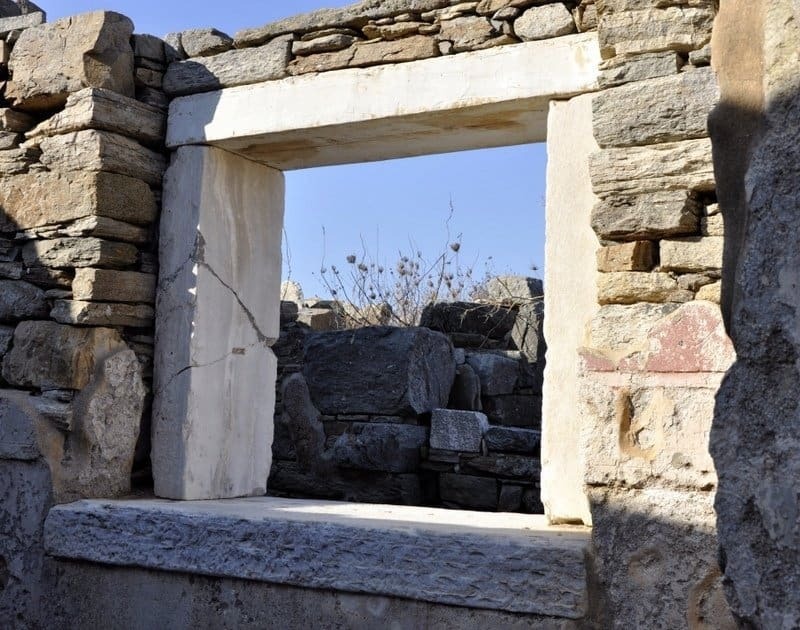 Since then I became so deeply intrigued by Greece, and this island of Delos looks really amazing. We spent a few family holidays in the Greek Islands when the children were young but I’d never been to Delos, Mykonos or any of the Cyclades. The light there is so clear – I’d like to visit Santorini too for their beautiful sunsets. I really like the sound of visiting somewhere that feels ‘lost in time’. I bet your imagination was running riot !